Fairfax today unveiled a national “digital-first” editorial restructure that it says will transform the company into one newsroom with its own internal newswire. Metro division group editorial director Garry Linnell, who briefed staff on Wednesday, said the plan was “the most significant editorial transformation in this company’s history” in a 25-page staff briefing. The publisher of The Sydney Morning Herald and The Age will remove divisions between various print, web, tablet and smartphone as it pushes ahead with plans to shed 1900 staff over three years and build paywalls around most of its content. 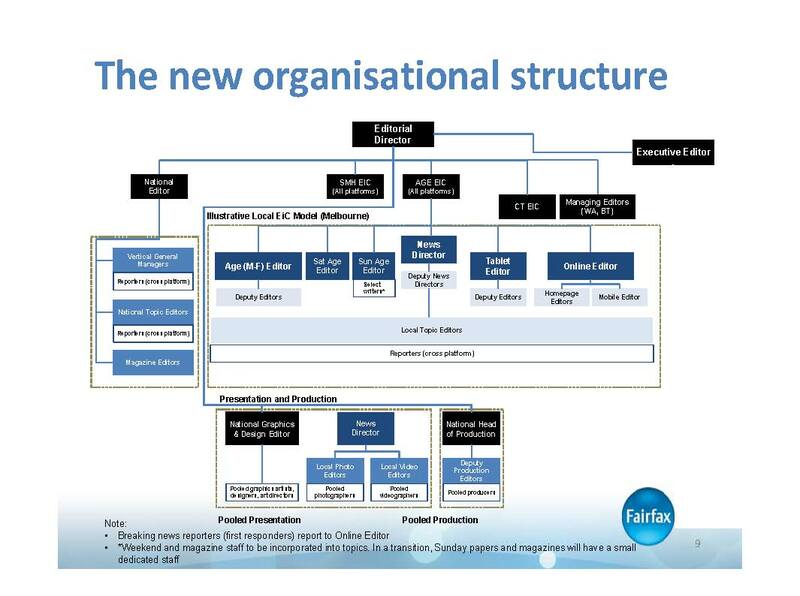 Fairfax’s one-newsroom model, which will come with a single art department, is aimed at removing duplication among Fairfax staff. “We will operate as one newsroom – across platforms, across geographies and across seven days,” Linnell’s briefing states. Under the new plan, Fairfax journalists will effectively become newswire reporters by filing copy on “rolling deadlines” across a seven-day roster for all platforms. Weekend and magazine staff will also be rolled into the one-newsroom model and report to a topics editor. The current way of operating leads to duplication, confusion and platforms not always getting the best content. While the situation has improved, they still waste the effort of editorial staff and managers because planning and commissioning decisions are not transparent or disciplined. With about 90 per cent of staff reporting to print editors and a daily rhythm revolving around a newspaper, they do not treat online audience equally and create additional work for staff, particularly in production. A number of new roles are being created and others being transformed. Editor‐in‐Chief: oversees journalism across all platforms – a transformative change from the current situation in which print and digital are managed separately. The EIC is the ultimate arbiter in the newsroom and the internal and external figurehead. Reports to the Editorial Director. News Director: the newsroom’s linchpin, effectively the head of content. Platform‐neutral, the News Director is the EIC’s delegate in day‐to‐day operations and forward planning. When questions are raised about when and where a story is published, the News Director makes the final call. News Directors chair the daily and weekly news briefings, manage quality control and Topic Editors’ needs/performance and ensure Platform Editors’ needs are met. They will be supported by deputies to ensure news director presence 6am‐late across seven days. active in ideas generation and execution by liaising with Topic Editors and News Directors. fellow Topic Editors. Editors of national topics report to the National Editor, editors of local topics report to the News Director. Reporters: Reporters will no longer be aligned to one platform – they will be organised into topics and will produce their stories for all platforms. Their aim will be the same: to set the agenda by breaking exclusive stories, finding fresh and compelling new angles and engaging our audiences. National of Production Head: a new role to lead a cross‐masthead, cross‐platform production team, elevating the quality of our online journalism. Producers: for the first time, digital, newspaper and magazine production staff across geographies will unite to form a multiskilled production team.